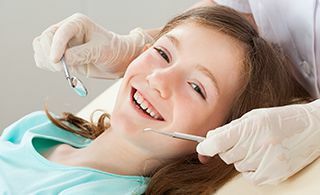 At Pediatric Dentistry of Prospect, we strongly recommend that parents bring their child in for a first dental visit when they’re around the age of one, or when their first baby tooth erupts from the gum tissue – whichever comes first. After this initial “getting to know you” visit, it’s important for them to then attend routine dental checkups every six months, or twice each year. Even when your son or daughter only has a few teeth, these regular examinations are very important because they allow Dr. Danielle and the rest of our staff to become very familiar with their unique smile and be able to identify any signs of damage or developmental abnormalities as soon as they arise. Our priority is to prevent the need for extensive dental treatment whenever possible! Evaluating the tooth surfaces for any signs of tooth decay. We can’t wait to welcome your son or daughter for their first checkup and many more after that. Contact our Prospect, KY practice today to schedule a visit! Dr. Danielle also sees patients from River Bluff, KY and other surrounding areas.